We are fortunate to live in a community with such diversity of flora and fauna and to have so many caring people who provide habitat in their landscapes and who want to help sick or injured wildlife. While there are times human intervention is the right thing to do, often times we can do more harm than good. It is fine to let nature take its course as I firmly believe in survival of the fittest: they are all parts of a larger food web. The natural order of the wildlife community should be honored and respected. Here is a look at a few animals, their caring for their young, their place in the cycle of life, and how you can help. Let’s start with rabbits, specifically Eastern Cottontails that have made their home in my side yard. They typically mate from March to September and have litters of 3-8 babies at a time and up to 5 litters per year! 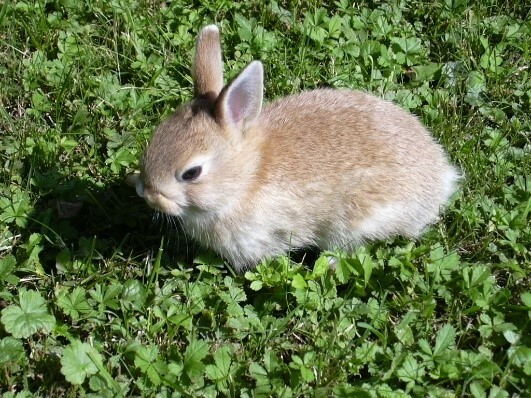 They typically build shallow nests of grass and fur in grassy areas right in the middle of your yard. Most predators won’t venture into the open so it is a safe option. If you stumble upon a nest in your yard, it is best not to move it to an area you deem safer. Mama rabbit knew what she was doing. She comes back twice a day to feed and groom the little ones, avoiding being spotted and drawing attention to the nest. If you notice babies visibly injured, bleeding or missing limbs, you could intervene at that point by contacting a rehabber or let nature take care of it. One step you can take to prevent injuries is to check your lawn for nests prior to mowing and mark the area with a flag or small marker so you know where they are. After predators, lawn mowers and weed whackers are the biggest threat to the babies. 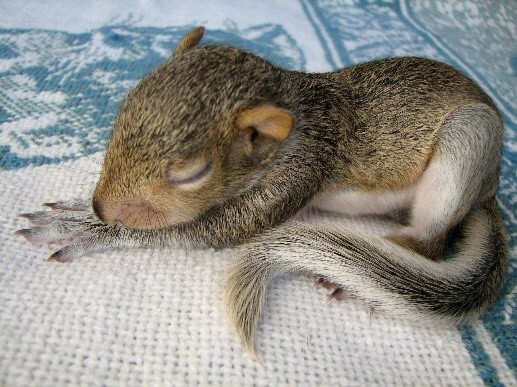 I also often see people “rescue” baby squirrels. Gray squirrels are the most common in the Cape. They have 2 litters per year between December and February then again between May to June with anywhere between 2-6 young at a time. Their nest is typically in the forks of trees, consisting mainly of dry leaves and twigs. If you come across a baby out of the nest the best course is to determine if it is injured. If not, do not handle the baby, leave it on the ground where you found it, the mother will retrieve it. If it is injured avoid over handling it, place it gently in a box with ventilation and contact a rehab center. One of the most misunderstood and most abused animals is the opossum. I personally think they are adorable. Some people are scared of opossums, feel threatened by them, or think they are rabid. In reality they are one of the most docile, harmless critters you will come across. Their defenses include freezing and playing sick by drooling and swaying, which is why people think they are rabid. They have extremely efficient immune systems and low body temperatures so they are resistant to rabies. A benefit to having them around is they can eat up to 4,000 ticks a day, reducing the spread of Lyme disease. 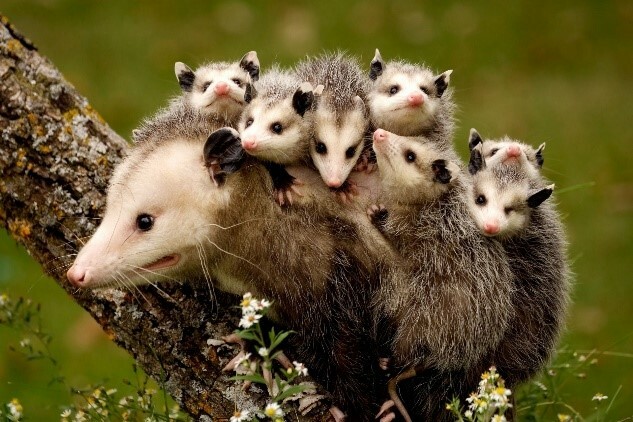 Opossums breed between January and July and babies are typically the size of a honeybee at birth. They are the only marsupial found in North America, meaning the babies live and nurse in their mama’s pouch. If you come across a baby opossum please understand their importance and accept their place in the ecosystem. If the animal is less than 7” he is still in need of care by the mother. Stand very quietly and listen for “sneezing” sounds the baby uses to call to its mother. If the animal is over 7” then he is just a juvenile and not needing intervention or care. He is best left alone. It is illegal to care for opossums unless you are licensed rehabber. If the animal is injured or you truly believe it to be orphaned or abandoned then contact a local rehab center. 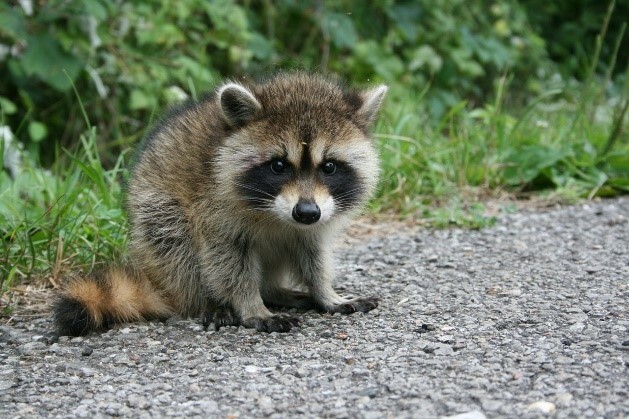 Raccoons, on the other hand are considered a vector species, meaning they can transmit rabies to humans and other animals: you should never handle them bare handed if at all, and they should never be trapped and relocated. Raccoons typically breed from January through mid-March with an average brood of 2-5 kits. The female raises them into the fall. Baby raccoons do not become nocturnal until adulthood so they can often be found wandering away from their mother during the day while she sleeps. If you spot a baby alone it does not mean it is orphaned. If you have determined it truly needs help, contact a vector-licensed rehabber (not all rehabbers can take vector species). Deer are often seen in abundance in the Broadneck peninsula. Unfortunately due to development their habitat is shrinking rapidly and they are visiting our yards more often. 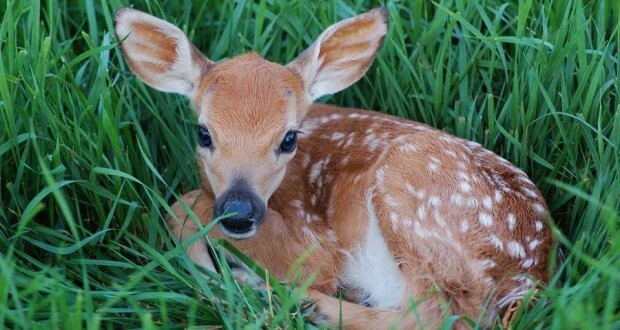 Fawns are often found alone and mistakenly thought to have been lost. If the fawn is lying down calmly and quietly their mother is nearby. She will only visit their babies a few times per days to nurse them so they can avoid attracting predators. Leave the fawn as you found her. The mother, though wary of human smell will return, but only after you left. If the baby is wandering and crying incessantly for a long period she may need help, in this case contact a licensed wildlife rehabber. 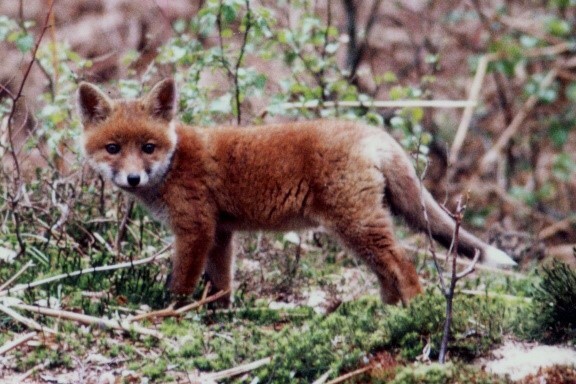 Another common Cape mammals is the fox, also a vector species of rabies. They are not nocturnal and can be seen throughout the day, especially when raising their young. Foxes breed from January through March with an average litter size of 4-5 kits. Babies are often left alone for long periods of time while their parents are hunting for food. They stay around the den playing until they are old enough to join hunting trips. If they appear energetic and healthy leave them alone. If you have reason to believe that both parents are dead then contact a vector-licensed rehabber.